In May 2014, Sydney’s Seymour Centre will be present Squaring The Wheel as part of its Arts Education Program. 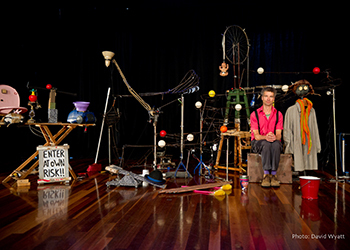 This award winning clowning show from the Adelaide Fringe Festival combines science with theatre using an amazing contraption that is built before your eyes. When an eccentric misfit meets a strange world of mechanisms, everything turns into a challenging and surprising discovery, where simple things become wonderfully complex. Kooky antics, absurd gadgets, tomfoolery and high energy are balanced with themes of loneliness, thinking outside the box, friendship and ultimately, finding one’s place in the world. A flying broom, two ugly screaming babies, 17 balls, 34 meters of bent steel and 15 marching eggs are just the tip of the iceberg of wacky materials and objects that are transformed during the show. Unpredictable, funny, touching, highly visual and occasionally out of control, Squaring The Wheel won the best children’s show at the Fringe and is a theatrical stage extravaganza. ‘The show is full of action and very entertaining but I want to encourage children to not always take the first possible solution and to put their own creativity and imagination into given objects and situations,’ says the show’s creator, Jens Altheimer. Altheimer, who is a performer, teacher and director of circus and theatre, became curious about contraptions and their possible theatrical applications some time ago. The contraptions he creates for Squaring The Wheel are over-engineered and complex, yet at the same time, raw and clunky. They also have a huge comical (and somehow philosophical) potential, providing the paradox of life not made easier (machines are supposed to help us), but more complicated. Using a unique mix of circus and clowning, the custom built contraptions appeal to both children and adults: who wouldn’t like to see a machine that uses an ironing board, toilet seat, vacuum cleaner, baby toy, mousetrap and other stuff to throw a hat onto someone’s head? An educational resource that accompanies the show includes a 20-minute interactive introduction to contraptions and the physics behind them. Science concepts are demonstrated with the help of an extra chain-reaction machine, highlighting concepts like gravity, friction, levers, counterweight, pulleys and stored energy. School groups attending Squaring The Wheel will receive teaching resources and study guides with key curriculum links and suggestions for how to link the themes and styles of each production within the classroom. Activities include: discussing the experience, genre, transformation and change, clowning, stagecraft and science experiments. For more information and bookings, visit the Seymour Centre website.